El Topo Chico has a rough day at Horror Hound Weekend, due to a long night of drinking Glazed Donut Vodka, Corn Whiskey, a Chelada, and more, with friends! 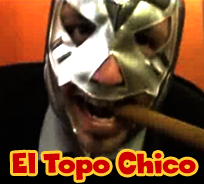 While El Topo Chico couldn't make it to Con X, that didn't stop El Topo Gordo from challenging Brian! Everyone's favorite convention luchadore gets into more wackiness at Anime STL! Also, be sure to come see us at the next convention, Fright Night Film Fest in Louisville KY, June 29th-July1st. A collection of outtakes and alternate scenes from our El Topo Chico mockumentary. Just who the hell is El Topo Chico anyway? Find out in this mockumentary shot at Flashback Weekend.